First dual champion Gordon since Ch Sleazak! The Gordon Setter Field Trial Society Open Stake on July 23rd was won by Ch Amscot Irresista Belle. As 'Triska' already has one Open stake win under her belt this win made her up to a Field Trial Champion, writes Christine McDonald. In the showring she has been awarded 5 CCs (plus 5 RCCs) so is undeniably a Dual Champion. She also is the only British owned Gordon Setter to win a major award at the World Show - she won the Reserve CACIB last year. Her breeding is largely that of Jane Osborn's Boyers line. 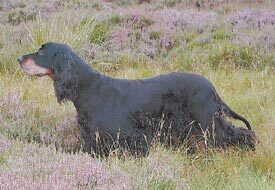 The last Gordon Setter to approach this level of competence in both disciplines was FT Ch Rowney of Crafnant in 1956 when he won 2 CCs. Within the sub-group another modern day Dual Ch is Dual Ch Fowington Sleazak who was born in 1991 and was made up in 1995. He gained his show title with Geraldine O'Driscoll and his working title with husband Peter. Dual Champions in other gundog breeds fall mainly in the HPR group, specifically to German Shorthaired Pointers. The first HPR dual champion was Mrs and Mrs Ian Sladden's Inchmarlo Graff Gerff of Prha, followed by the Bottermans Axters Tochter. Then came Maidams Dark Claret of Trolanda owned by Mr Ashdon, then Madge and Cliff Simonds' Swifthouse Tufty, followed by his daughter - Geramers Victress of Swifthouse. Her sister Geramers Shannon was also dual titled, owned by Mr and Mrs Gatclife. Dual Ch Staifoot Sobrig was campaigned to his two titles by Mr and Mrs Pepper, and Keidy White Knight achieved the same two titles. The most recent HPR Dual Champion is Swifthouse Bletchingdon, the third such title holder for Cliff and Marge Simonds.